Today, we’re aiming to change all that. Introducing Logitech® Harmony Express — an entirely new Harmony experience that’s simple and stress-free enough for everyone in the family to use. Harmony Express blends the power of Harmony entertainment control with the convenience of Amazon Alexa built-in, so you can effortlessly use your voice to control your favorite home entertainment devices and do almost anything else Alexa can do. Designed with a new kind of customer in mind, the Harmony Express remote looks completely different from previous iterations of Harmony. 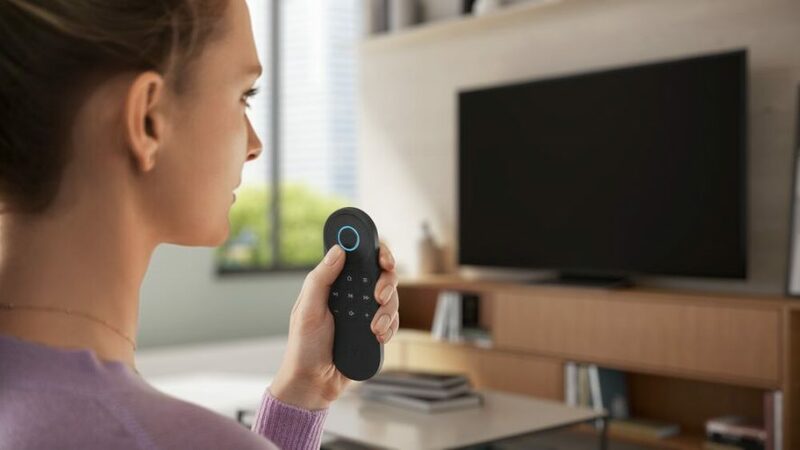 It’s been streamlined to feature the most frequently used entertainment controls and adds a prominent Alexa button you can push to easily engage in the voice service. This way, Harmony Express gives you everything you need, but nothing you don’t — harnessing the power of voice to make it easy for everyone in the household to access the entertainment experiences they want. Now you can just press-and-ask to watch live TV, launch your favorite streaming apps or change the channel through Amazon Alexa. Harmony Express can be the first Alexa device in the home or one of many, working in tandem with the home’s previously-existing Amazon Echo device. Either way, it will be simple enough for every user to set up, use and understand. With Alexa built-in, you can also easily search and navigate content, control smart devices, access thousands of skills and more – all you need is your voice. And what about when the remote inevitably gets lost in the couch cushions? The new Harmony Express mobile app includes a remote finder that triggers a tone on the remote to help locate it. Or, owners with existing Alexa devices can simply ask Alexa to find their lost Harmony Express. The remote finder was the number one most-asked-for feature by users — you asked, and we answered. Combining Alexa built-in and the power of Harmony into a familiar but simplified remote form factor, Harmony Express makes accessing your entertainment a breeze. Harmony Express launches today in the U.S., and is available immediately on Amazon.com and Logitech.com for $249.99 (it will hit Best Buy stores and BestBuy.com soon). For easy setup, the free Harmony Express mobile app is available on the App Store for iPhone users and Google Play for Android™ users.